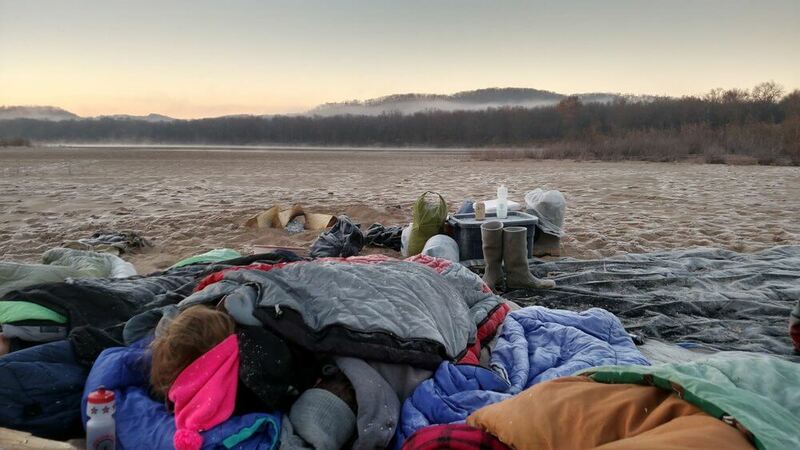 Wisconsin Canoe generally puts 20-35 different troops on the river each year for an overnight sandbar camping excursion accommodating up to 250 scouts at a time. Why should your troop paddle the Wisconsin River? The Wisconsin River is a fantastic place for scout troops to get into the wilderness and practice their skills. This is one of the few places in the Midwest that offer a true wilderness camping experience. You’ll paddle downriver with your equipment and find your own campsite (choose from any of a hundred different sandbars); no electricity, no bathrooms, no neighbors. Check out our canoe camping page for specific details about canoe camping on the Wisconsin River and the overnight trips we offer. Scouts are also able to earn a number of merit badges – canoeing and kayaking chief among them. See Badge Requirements below. Why should your troop choose Wisconsin Canoe Company? We provide composite boats and comfortable ski-style life vests. Our boats are the youngest on the river (and we can slip in a couple seatbacks for the trip leaders). We shuttle you upriver at the start of your trip so you can paddle back to the cars on your own time. Finish, pack up, go. We’ll do the rest. Your entire reservation can be done online. We’re available via phone, email, SMS, and facebook. It’s not uncommon to get a quick response at 10pm and our emergency line is staffed 24 hours a day. Variable pricing means your troop can get significant discounts on midweek trips and, to a lesser extent, on the weekends. We guarantee 130% that the boats you reserve will be ready and waiting for you. No overbooking here. Thousands of customers and hundreds of thousands of shuttle miles – no accidents, 100% survival rate. In case of inclement weather, we’ll keep you up to date with email and SMS alerts. The canoe trip was epic and will be remembered for a lifetime. The canoes and equipment were tip top and you guys were great. Website was very helpful and pricing was competitive. I will definitely recommend WCC to anyone. We will be back! Have a great rest of the season! Safety is always a consideration for scout groups and while no outdoor outing is without risk, the Wisconsin River does offer a few benefits to help leaders and put parents at ease. Yes, the lower Wisconsin is completely protected from development, thus the feeling of wilderness, however there are convenient access points every 6 to 8 miles along the riverway in case a quick departure is necessary. Cell phone coverage is getting more reliable along most of the river depending on your cell provider (U.S. Cellular and Verizon are best; AT&T/Sprint/T-Mobile less so but generally still adequate and text messages should go through). Most important, in case of a real emergency, both Prairie Du Sac and Spring Green (the start and end point to most trips) have search and rescue teams specifically trained and equipped for river rescue (this includes hovercraft). There is no charge for these services in an emergency, simply dial 911. Wisconsin Canoe provides all equipment necessary to safely canoe or kayak the river. Our equipment is never more than a few years old and very durable. Our boats (Old Town Discoveries and Necky Manitous) are a 3 layer polyethelene construction which makes them quiet, stable, and indestructible. It’s also worth mentioning that these will not become extremely hot in the sun like aluminum canoes, i.e. you won’t get burned. Canoes are 15’8″ long and 36″ wide with a weight capacity of 1,100lbs. They’ll hold more than you think but all the same, try to pack only what is necessary. All scouts are also provided with a comfortable ski-vest style life jacket they won’t mind wearing and outfitter grade paddles. Scouts qualify for our large group and overnight discounts. Depending on the size of your group and the duration of your trip, scouts will receive up to 20% off the standard day rate. These discounts are automatically applied when booking your trip through our automated reservation system. The larger your group, the bigger the discount. If you also choose to go overnight, you’ll see an additional price drop. If your group has a tax exempt form, you can send us an electronic copy after making your reservation and we will fully refund all sales tax. Trip planning is covered in more depth in the Planning Center. This would be a perfect opportunity to prepare your group for canoe and/or kayaking merit badges. Show that you know first aid for injuries or illnesses that could occur while canoeing, including hypothermia, heat reactions, dehydration, insect stings, tick bites, and blisters. Demonstrate the proper technique for performing CPR using a training device approved by your counselor. The BSA Safety Afloat policy. Tell how it applies to canoeing activities. The most common weather and water-related hazards encountered while canoeing and how to deal safely with each one. Name and point out the major parts of a canoe. Describe how the length and shape of a canoe affect its performance. Discuss the advantages and disadvantages of the different materials used to make canoes. Name and point out the parts of a paddle. Explain the difference between a straight and bent-shaft paddle and when each is best used. Demonstrate how to size correctly a paddle for a paddler in a sitting position and a kneeling position. Name the different types of personal flotation devices (PFDs), and explain when each type should be used. Show how to fit and test properly a PFD of correct size. Discuss the general care and maintenance of canoeing equipment. Discuss what personal and group equipment would be appropriate for a canoe camping trip. Describe how personal and group equipment can be packed and protected from water. Demonstrate how to load and secure equipment in a canoe. Using appropriate knots, demonstrate how to secure a canoe to a rack on land, a vehicle, or a canoe trailer. Safely carry and launch the canoe from a dock or shore (both, if possible). Safely land the canoe on a dock or shore (both, if possible) and return it to its proper storage location. Demonstrate kneeling and sitting positions in a canoe and explain the proper use for each position. Change places while afloat in the canoe. In deep water, exit the canoe and get back in without capsizing. Capsize the canoe and demonstrate how staying with a capsized canoe will support both paddlers. Swim, tow, or push a swamped canoe 50 feet to shallow water. In the shallow water, empty the swamped canoe and reenter it. In deep water, rescue a swamped canoe and its paddlers by emptying the swamped canoe and helping the paddlers safely reenter their boat without capsizing. Pivot or spin the canoe in either direction. Move the canoe sideways or abeam in either direction. Move the canoe in a straight line for 50 yards. Launch from shore or a pier (both, if possible). Using a single-blade paddle and paddling only on one side, demonstrate proper form and use of the forward stroke, backstroke, draw stroke, pushaway stroke, forward sweep, reverse or back sweep, and J-stroke. Repeat while paddling on the other side. While paddling on one side only, paddle a 50-yard course making at least one turn underway and one reverse of direction. Repeat while paddling on the other side. Make a proper landing at a dock or shore (both, if possible). Store canoe properly (with assistance, if needed). In deep water, exit the canoe and then get back in without capsizing.